iowahawk: The "Q" is for "Quality"
The "Q" is for "Quality"
Hello, valued Al Qaeda associate! Welcome to the inaugural issue of Vistas, the new electronic newsletter designed to keep you informed on all the fast-paced comings and goings within our Total Quality Jihad family. In a dynamic marketplace characterized by rapid change and unexpected missiles, even the most disciplined adaptive organizations can find it challenging to keep the lines of communication open. Without understanding the strategic "big picture," associates will sometimes be confused by misleading rumors they read on unreliable infidel blogs and websites like "F*cked Insurgency" and "Jihad Deadpool." With Vistas, you will learn the real story -- of how we are attacking the competitive casualty gap with a paradigm-changing tactical adaptive strategy focused on paradise value optimization. 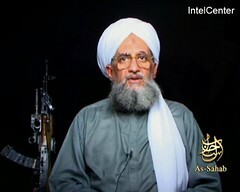 Yes, there will be some changes, but our core leadership mission remains the same one established by Chairman Emeritus Osama Bin Laden when he founded Al Qaeda in his family goat shed nearly 15 years ago: to create a robust, cave-centric, best-of-breed strategic organization for global caliphate management solution services. If we all pull together as accountable subteams, we are on-track to rebuild momentum after the Q4 Infidel elections! As a commitment to our spirit of goal-oriented adaptive martyrdom innovation, I am proud to announce the launch of Qaedant, our new corporate branding identity. Developed in conjunction with our strategic branding agency FDB&D-Medina, this handsome new organizational logo will help us maintain consumer mindshare and let the world know that we continue on the cutting edge of advanced Jihad technology. Show your team pride by buying official Qaedant logo merchandise from the attached electronic catalog -- including mugs, keffiyas and semtex belts! As you have possibly heard by now, Team Satan and their subsidiary Iraqi Security Forces have made several key market acquisitions in the last few months. In order to meet Q3 Return-on-Mayhem targets and maximize stakeholder value, we need to refocus our client-facing resource model. As we are currently seeking a 17th round of venture funding, budgets are extremely tight, and this will require reducing our internal work team payroll load through adaptive right-sizing on a go-forward basis. Accounting estimates indicate that much of this will be achieved via natural attrition and Apache Hellfire missiles. Still, in order to achieve costing targets, we will need to engage in involuntary outboarding. The Communications department will be most directly affected by this initiative, as we continue transitioning of our day-to-day public relations efforts to low-cost offshore service providers like Huffington Post, DailyKos, and Democratic Underground. Like many organizations, Qaedant is searching for ways to contain the spiraling cost of associate health care benefits. Working with our insurance provider Mutual of Yemen, we have created a new custom healthcare benefits package for associates that will help cap rising expenses on a forward basis. Starting August 1, this plan will institute a new $2000 copay for outpatient dismemberment services and psychiatric care. The new plan will also cap the number of dependent wives covered, and eliminates the dental record identification benefit. Details are covered in the attached form. While team health benefits will be scaled back, we will be offsetting these changes with enhancements to associate retirement plans. For example, I am pleased to announce an exciting new 90-virgin paradise pension package, representing a 25% increase in virgins over our previous plan. Please see your local imam for details. Everyone is invited to Qaedant's first annual Diversity Celebration Fair Wednesday morning at Cave 11-B. Find out how the world's ever-increasing diversity provides a growing strategic opportunity for us to blow up infidels of every color and orientation. HR Team Leader Hassan Abdullah will discuss how Qaedant is expanding martyrdom job search to recruit from traditionally-underserved groups, such as unwilling women and 8-year old retards. See you at the Fair! Nobody likes a messy lunch break cave. It's inconsiderate to your fellow Qaedant associates, and the cleaning slaves who have to pick up your falafel wraps and missing limbs. If you have been mortally wounded and are bleeding uncontrollably, please go to the designated dying area near the scrap metal pile in parking lot D.
Congratulations to Khalid Muhsin and Hussein Mustafa for reaching their three month service anniversaries. Please drop by their desk and thank them for a survival well done. And please -- no ribbing the "old timers!"